If there were a Mt. Rushmore for SCBBQ, Rodney Scott’s ever-smiling visage would be permanently etched into the mountainside. Having gotten his start at the age of 11 cooking his first pig for his father Rosie at Scott’s BBQ in Hemingway, their converted gas station/convenience store, Rodney is now among SCBBQ royalty. In fact, Scott’s BBQ in Hemingway was the very first SCBBQ restaurant we visited and reviewed way back in the summer of 2012. For us, it set the standard that few ever matched. Find it and Rodney’s Charleston location on the SCBBQ Trail. Scott recently opened his own restaurant, Rodney Scott’s BBQ, in downtown Charleston. While the Hemingway location continues to be exceptional, it has never been what one might consider a complete restaurant. While you can eat at Scott’s, most folks don’t. There are a few picnic tables outside and one kitchen table inside. As limited as the table options is the menu. On our visit, we had a BBQ plate with slaw and beans. Not sure if things have changed, but if I remember correctly, those were the only side options at the time. In fact, these limitations and more made us question whether Rodney Scott’s new venture would be successful. History has, of course, proven Scott has quite a success on his hands. 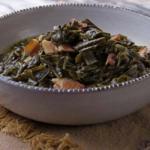 The collards are Rodney Scott’s are delicious as well. They have hints of smoke and strings of meat and a hint of that sauce that makes Scott’s BBQ even more special. 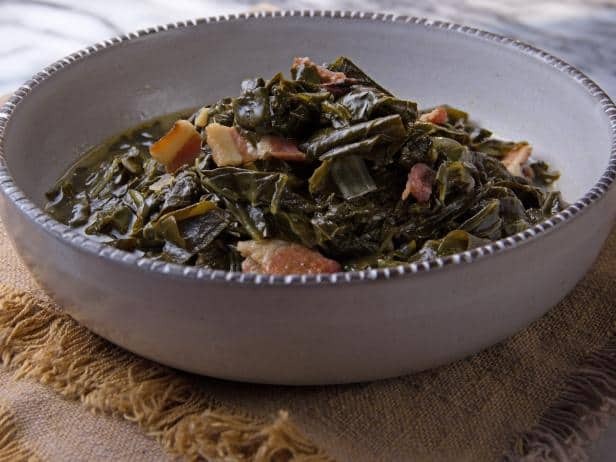 In the “Old School, New School” episode of Man, Food, Fire, Rodney shares his recipe for those collard greens with host Roger Mooking. Heat the lard in a large, heavy-bottomed pot over medium heat. Add the onions and garlic; saute until translucent, 5 to 7 minutes. Add the collard greens, pulled pork, and 4 cups water. Cover and simmer until the greens are completely tender, about 45 minutes. Stir in the salt, cider vinegar, and BBQ sauce.